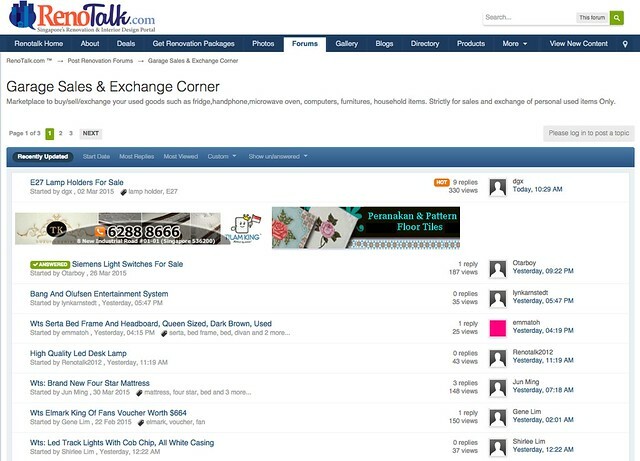 RenoTalk "Garage Sales & Exchange Corner"
RenoTalk “Garage Sales & Exchange Corner” is a forum section of RenoTalk.com, where people sell their second hand furniture, home items, electronics and appliances. To sell your item, you’ll have to create a new topic, this requires a RenoTalk membership account, which is free. Registering with the website is quick and straightforward. The forum is relatively active, it usually has over 100 active users on average, across all the forum sections. One advantage of using RenoTalk “Garage Sales & Exchange Corner” is that it’s not filled with as much ads and paid listings, compared to online classifieds like GumTree and Locanto. Some of the used furniture you’d commonly find in the forum includes modern style sofas and tables. There are also many posts offering to sell other household items like – lighting fixtures, fans, coffee machines, sound systems, water dispenser, etc. If you’re interested in purchasing the item, you can leave a reply on the thread, or send the seller a private message. A number of the sellers also leave their emails and handphone numbers, so you can contact them directly. You’ll be able to post photographs of the items you’re selling, but you’ll have to upload it onto a separate image host. Their post message system allows of easy insertion of email address and links, overall, the interface is easy to use. “Garage Sales & Exchange Corner” displays posts which are less than 30 days old, all earlier posts are automatically filtered out. All the listings are displayed on a single page.